As you know here at the Disney Fashionista, we love Disney bounding, and we love new sparklies to wear! So I was over joyed to find these unique bracelets from Ashley Bridget! 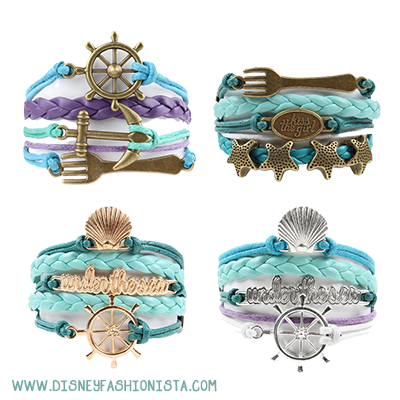 I first stumbled upon these Disney inspired gems by following the siren’s song of the Mermaid Collection bracelets. The purples and sea blues remind me of Ariel right away, and of course the dinglehoppers just bring it all together! The most alluring aspect of these layered bracelets is that they are not an in your face depiction of a character, which makes them great for wearing in a Disney bound ensemble! I also adore the that they included the ship steering wheels, it makes me think of Prince Eric, and I love that romantic notion! As I fell further and further down the rabbit hole of gorgeous goodies, I noticed a bracelet emblazoned with “Absolutely Mad”. As I peered at this fun yellow, and blue jewelry set, I saw the infamous 10/6 hat of the Mad Hatter. 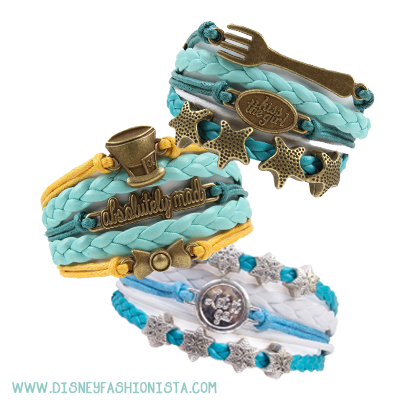 I couldn’t believe it, Alice in Wonderland inspired bracelets! The “Wonder” collection has the Mad Hatter as mentioned before, A red and black Queen of Hearts, a pink and white Cheshire Cat, and last but not least a curious little black, blue and white bracelet inspired by our Alice. The “Cheshire” is more understated and classier than the typical accessories of this character. It features a simple cat outline, and a subtle “meow” tagline. No fantasy inspired collections could be complete these days though,with out a little bit of Frozen. The “Frost” collection embodies the essence of winter, with shimmering snowflakes, and soft hues of blue. One stands out clearly with a small medallion reading “Let it Go” with layers matching the color of Queen Elsa’s dress from the hit movie. 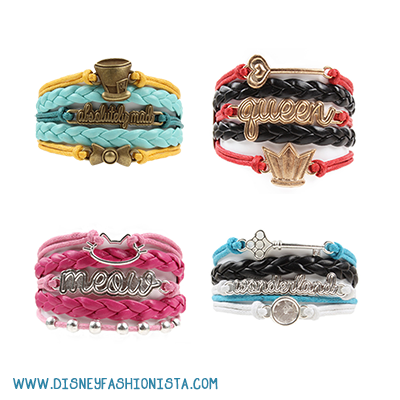 Any of them would be the perfect complement to an Elsa bounding look for sure! Keep Calm And Put Your Ears On!! Disney Bounding With The Disney Fashionista- Disgust From Inside Out!